The 3D Alignment Plugin overlays molecules onto each other by translating and rotating them in the space. The molecules shoud be pasted on to the same MarvinSketch canvas by reading multiple molecules from a file. You can also copy & paste or drag molecules from another sketch panel. The input can be two or more molecules in 2D or in 3D. If 2D molecules are given, their 3D structure is automatically generated.The molecules can be treated rigid (then the original conformation is preserved), or flexible (then dihedral degrees of freedom are added to the molecule). To preserve the input conformation simply select the molecule on the canvas. The output is the ensemble of aligned molecules in displayed in a MarvinSpace canvas. The input and output molecules are all displayed in different colours and shown in a tree view on the right side of the canvas. To save the aligned orientation use the popup menu and click on the molecules with the right mouse button. Align by extended atom types: extended atom types are assigned to each atom to enable chemically relevant atomic overlay. During the alignment process the overlap of the atoms of the same type is maximized. Types differentiate atomic number, hybridization state and aromaticity, e.g. aromatic nitrogen atom is not matched against a tertiary amine. These extended atom types correspond to the ones used in Dreiding force field. Align by common scaffold (MCS): the atom-atom pairing is obtained from the 2D maximum common substructure of the molecules. 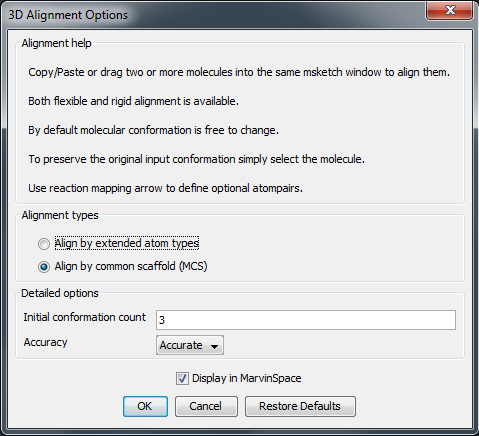 Alignment by extended atom types is applied on the non-MCS atoms. Initial conformation count: the number of diverse conformations to generate as an input for the alignment. Accuracy: determines the alignment accuracy. Normal, fast and accurate accuracy options are defined. Display in MarvinSpace: if ticked, the result window is a MarvinSpace 3D viewer. Molecules are visualized in different colours for better distinction of structures. If you know which atoms to overlap use the Reaction arrow tool to connect them. This can improve the alignment. If you have only 3D molecules as input and you select one of them, its original conformation will be preserved during the alignment, while others remain flexible. Click on the result window with the right mouse button and select "Save As" from the pop menu.